Road to Peace Films makes consciousness-raising documentary films that inspire a new global philosophy of altruism, community and loving kindness. The company’s Managing Director, Leon Stuparich, has 20 years experience in broadcast media and is a respected Documentary Film Editor working for UK and US Productions, including the BBC and Channel 4. Leon’s interest in Peace was seeded in the 1990s while witnessing his family live through the horrors of war in Former Yugoslavia, stirring him to investigate the root causes of conflict and pathways to peaceful resolution. In 2007, he began producing and directing independent feature documentaries with the potential to inspire personal and collective transformation. 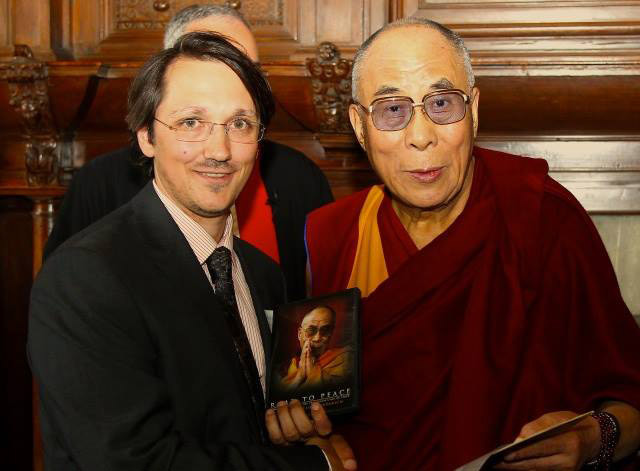 The first of these, Road to Peace – an award-winning, fly-on-the-wall documentary sharing the Dalai Lama’s vision of a world at Peace – was entirely self-funded and was recently released digitally worldwide with renowned distribution company, Gravitas Ventures. T he film is now available on multiple online platforms including iTunes, Amazon and Google Play. A three month tour of the film from June-September 2015 coincides with the Dalai Lama’s 80th Birthday celebrations in July. Continuing the company’s quest to evolve humanity, Road to Peace Films is currently developing some exciting new film projects, soon to be announced.